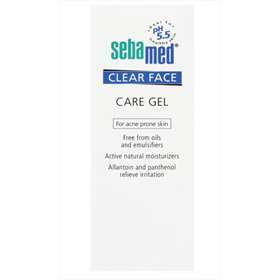 Sebamed Clear Face Care Gel helps heal acne and moisturise the skin. With the same pH as healthy skin (5.5) and Aloe Clear Face Care Gel gently soothes irritated and rough scaly skin while supporting and protecting the skin's natural barrier to retain moisture. Combats pimples, blackheads and skin impurities. Hyaluronic acid increases the moisturising binding capacity of the skin. Allantoin smooths rough scaly skin. Free from oils, emulsifiers, perfume, or colourants. Suitable for acne prone and oil skin. Cleans face thoroughly and apply a small amount of Clear Face Care Gel and distribute evenly on the entire face. Aqua, Aloe barbadensis leaf juice, Propylene Glycol, Glycine, Sorbitol, Panthenol, Sodium Hyaluronate, Allantoin, Sodium Carbomer, Citric Acid, Sodium Citrate, Phenoxyethanol.